– Optimium for use in close quarters or on irregular shapes. 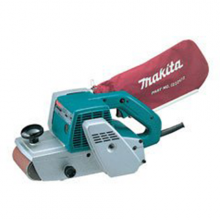 – Belt speed can be adjusted for sanding a wide variety of materials. – Multi-position side handle for easy and comfortable operation. – Lock-on button for continuous operation. – Double Insulation, Variable Speed and Dust Collecting. – Perfect for flush along side sanding. – Labyrinth construction protects unit from sanding dust. – The front precision roller runs on sentried brushes to give accurate belt alignment. 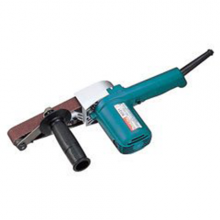 – The front auxiliary handle is specifically locate for fatigue free and sustained sanding. – The externally accessible brushes can be quickly exchanged when they become worn out.